My sister's getting married tomorrow. As you might imagine, I have weddings on the brain, and talking to me about anything else this week is useless. 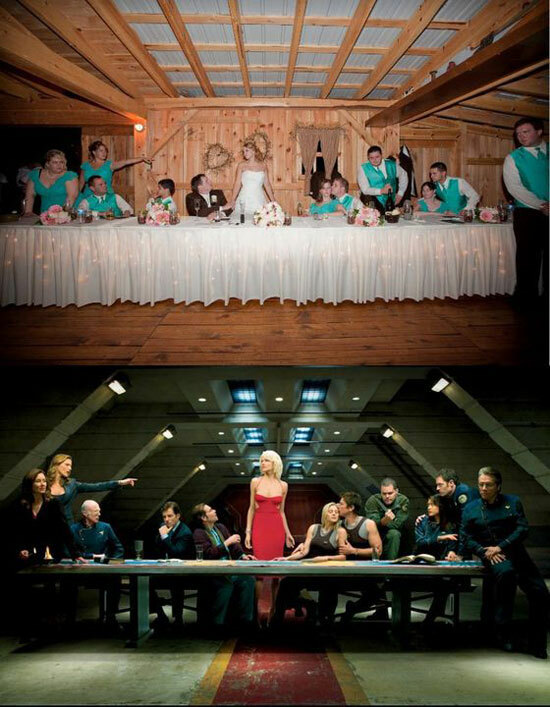 So here are a few of the best sci fi, fantasy and steampunk-flavored wedding photos scoured from the depths of the internet. 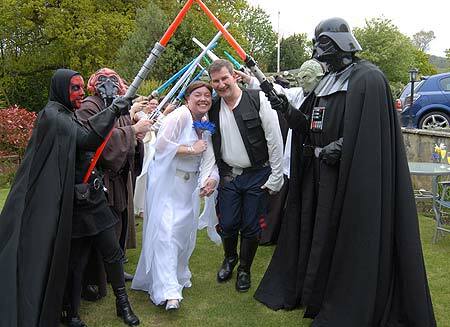 Star Wars weddings are practically their own nuptial sub-genre. The lightsaber fight at the top of this post was from a wedding detailed here, in which the groomsmen surprised the newly married couple by showing up with lightsabers and handing the groom his own weapon. 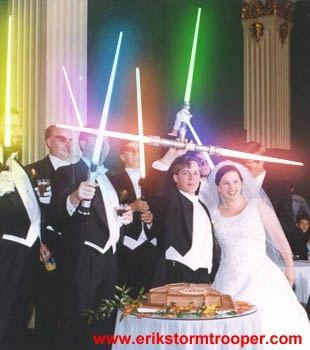 The groom, who was given a two-sided Darth Maul model, was delighted. 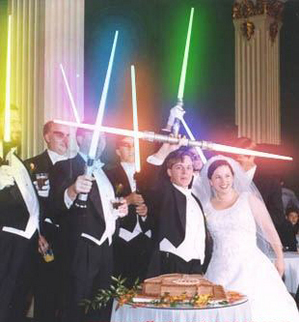 The couple in the photo below got married on May 4 — as in, May the Fourth be with you. And here's another costume-heavy Star Wars offering, this from jwinokur's Flickr page, which has lots of other great shots from the big day. Don't worry, Star Trek fans. You've got some wedding love, too. The Las Vegas Hilton was the home of the Star Trek Experience from 1998 until 2008 when, sadly, it closed. 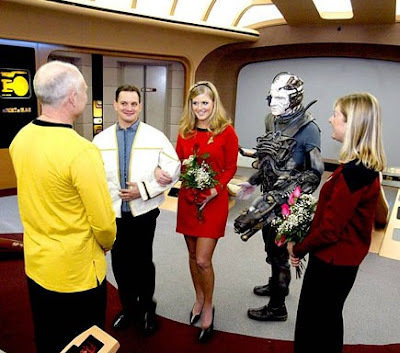 But during those magical 10 years, you could get married on the bridge of the Enterprise. I personally wouldn't be comfortable with a heavily armed member of the Borg as a witness, but different strokes for different folks. 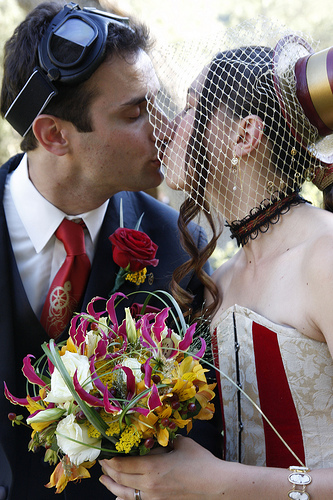 Steampunk weddings? You bet! You can't go wrong with goggles, corsets, tiny hats and lots of brass. GothicWeddingPlanner.com has a nice how-to guide. Here's another good planning guide at InfoBarrel.com, complete with lots of pictures and suggestions. 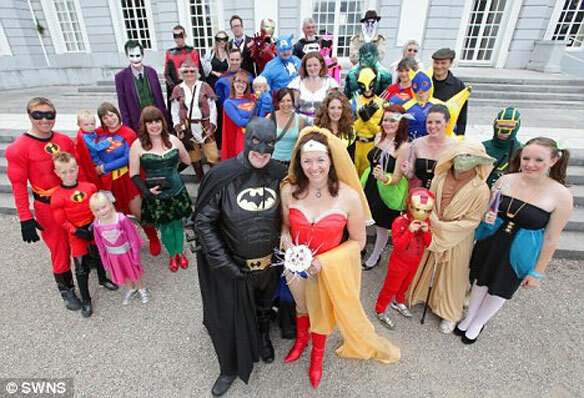 Here's a geek-splosion of a wedding. Sure, you're mixing your Marvel and your DC and your Pixar and your George Lucas. And yeah, Rorschach's hanging out in the back, all creepy-like. But I bet this was one heck of a party. 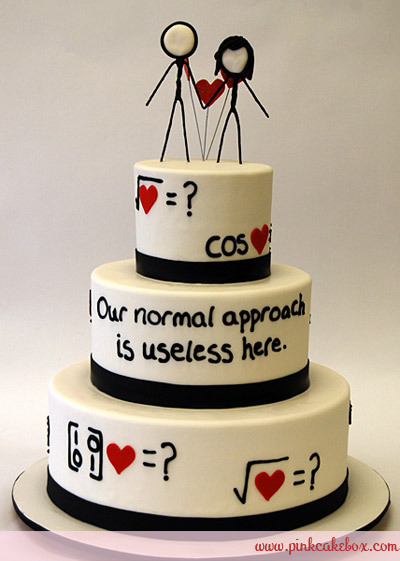 Let's face it, it's not a wedding without cake. One of my favorites right now is this gorgeous creation inspired by one of the xkcd's webcomics. Best wishes to my darling sister and her charming fiance on a long and lovely life together! Do you think I'll be able to talk her into a few nerdy pics of our own this weekend so we can add to the collection? There is precedent for this in the middle of Illinois! I went to high school with the groom mentioned in the story below. I just wish this included a picture as the original article did. 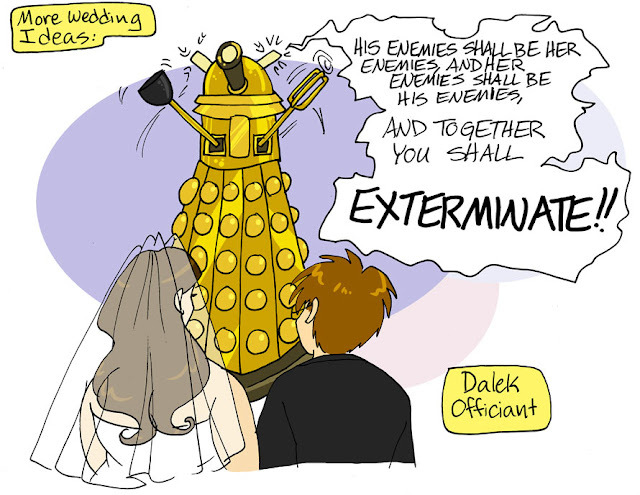 My favorite line is, "The ceremony included having the Rev. David Chumney, the groom’s brother-in-law, dress as Darth Maul..."
This totally inspires me for when I get married. Except for coming in superhero costumes. Claire, that's so cool! Were you at the wedding, too, or did you read about it after the fact? And dorogaya, I agree. 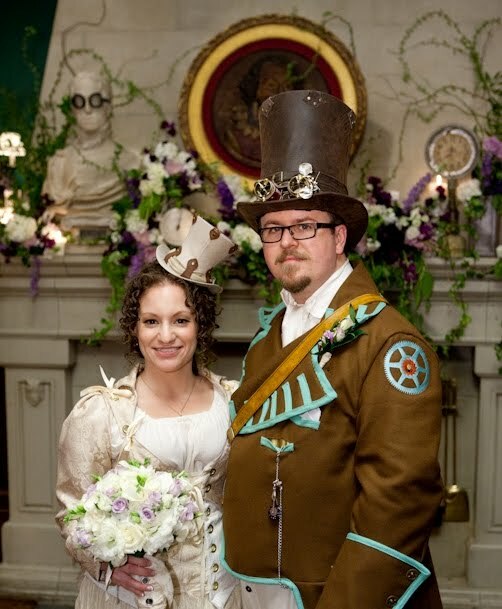 I prefer the weddings where people are in a traditional gown/tux, but they augment with props and poses. My mother in Springfield is a chronic newspaper clipper of the State Journal-Register, and I got the original article in the mail, along with the great picture. The groom wore Luke Skywalker and they had a Millennium Falcon cake. It was in Abraham Lincoln's old family church on 7th St. I imagine Abe was spit rotisserie-ing at the Tomb that day. What sports! I can't imagine Fr. Luis dressing up as Darth Maul at our wedding. Best of luck to your sister and have fun! I showed these photos (along with some zombie wedding photos for good measure) to the Las Vegas bridal shops I visited. They did try to help, though.